MOVED by the series of allegations of extra-judicial killings of people including women and children in the North East and members of the Indigenous People of Biafra during some of their peaceful protest sessions by some of its personnel, the Nigerian Army, Wednesday, set up an eight-man panel to investigate the allegations. The allegations, according to Buratai, include the Amnesty International reports, Indigenous People of Biafra, IPOB, allegations made by other groups and individuals of rights violations of arrested Boko Haram terrorists against some Army personnel and commanders based on which some of them are already suffering discriminations in some quarters. The allegations range from extra-judicial executions, arbitrary arrests, detentions, torture and enforced disappearance of suspected Boko Haram terrorists. “These allegations are not good for civil-military relations and are capable of demoralising the Nigerian personnel in the performance of their constitutional roles, “he said. 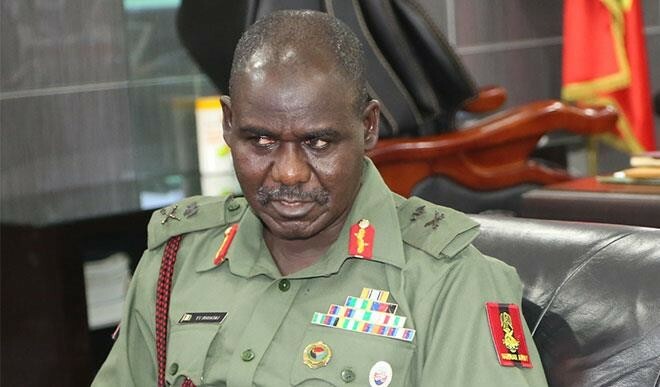 Buratai said it was expedient to thoroughly and impartially investigate the allegations in order to find out the facts of the matter to enable relevant authorities take appropriate actions. But Buratai asked the panel not to revisit allegations already investigated by state governments or the National Human Rights Commission through similar panels. The Army’s special board of inquiry,which has Major General Ahmed Tijani Jibrin, rtd, as president, according to the Army boss, was set up to investigate the matter and establish the true situation of the whole allegations. Buratai, who noted that the setting up of the panel to investigate the alleged killings and human rights violations by some personnel of the Nigerian Army was in line with the provision of Section 172(1) of the Armed Forces Act, said in spite of the allegations, both Nigerians and non-Nigerians have acknowledged the success recorded by the Nigerian Army in the ongoing operations against terrorism and insurgency in the country. “The success recorded in the ongoing operations against terrorism and insurgency is evident and many individuals, both Nigerians and non-Nigerians, have acknowledged and applauded our methods as a professional and heroic. “But we are also aware that there are some persons and organisations who have expressed concerns or even alleged cases of misconduct and abuses by some of our personnel especially in the early days of the counter terrorism and counter insurgency operations, “he said. Other members of the panel include Brigadier General Dadan Garba, rtd;Brigadier General Abdulqadir Guide, rtd;Brigadier General O. Olayinka ;Col. L. B. Mohammed ;Col. UM Wambai ;Mr Olawole Fapohunda and Lt. Col. CM Akaliro, who is the panel’s secretary. Join this cult Benefits. Do you want money in all colors, money in all currency, money in all denominations, just contact us.